Holy Crap, Is This Mark Zuckerberg's Embarrassing Childhood Angelfire Website? The word on the interwebs today is that this 1999 Angelfire page belongs to one Mark Zuckerberg. Yes, that Mark Zuckerberg, which means this could be the very first website that the hoody that made Facebook ever created. If true, it's a time machine into the 15-year-old brain of the most powerful man on the Internet. As of now, the web is pretty small. Hopefully, it will grow into a larger web. This is one of the few applets that require your participation to work well. If your name is already on The Web because someone else has chosen to be linked to you, then you may choose two additional people to be linked with. Otherwise, if you see someone who you know and would like to be linked with but your name is not already on The Web, then you can contact me and I will link that person to you and put you on The Web. If you do not know anyone on The Web, contact me anyway and I will put you on it. In order for this applet to work, you must E-Mail me your name and the names of the two people that you would like to be linked with. Thank you! The Java drawing tool was also a good time. I'm beginning to think that this Angelfire page is way more fun than Facebook. So is this the real deal? It looks like it. Motherboard discovered that the contact e-mail of the Angelfire page (Themarke51@aol.com) is an old AOL account under the primary account of 'ekzooks'. Which is interesting because that 'ekzooks' username has been used all over the Internet by a Dr. Edward Zuckerberg. Who is Dr. Edward Zuckerberg? Well, only the father of Mark Zuckerberg. Everything seems to really point to 15-year-old Zuck creating this Angelfire page but with the Internet being what it is, you never know if this is just some sort of elaborate hoax by some hungry app developer who thinks magnetic poetry can be sold for millions. Still, whether Zuck really once called himself Slim Shady or not, getting a glimpse of what you did as a 15-year-old is never forgiving. 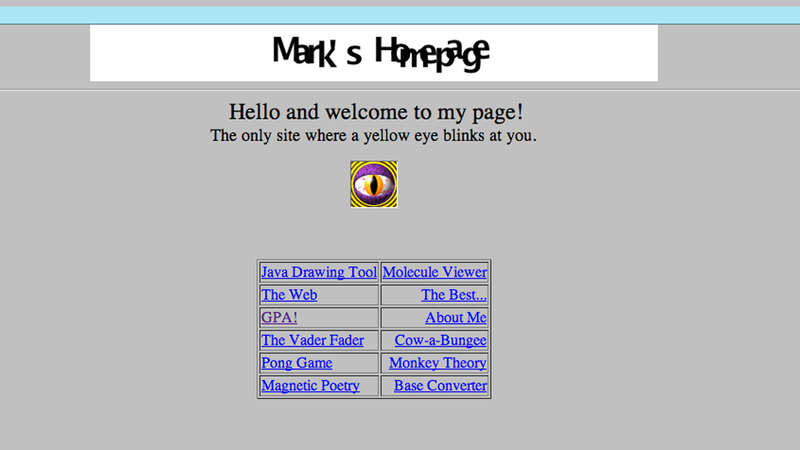 You can see more of what might be Mark Zuckerberg's first website here.